“Security is to have an alternative,” we are told. 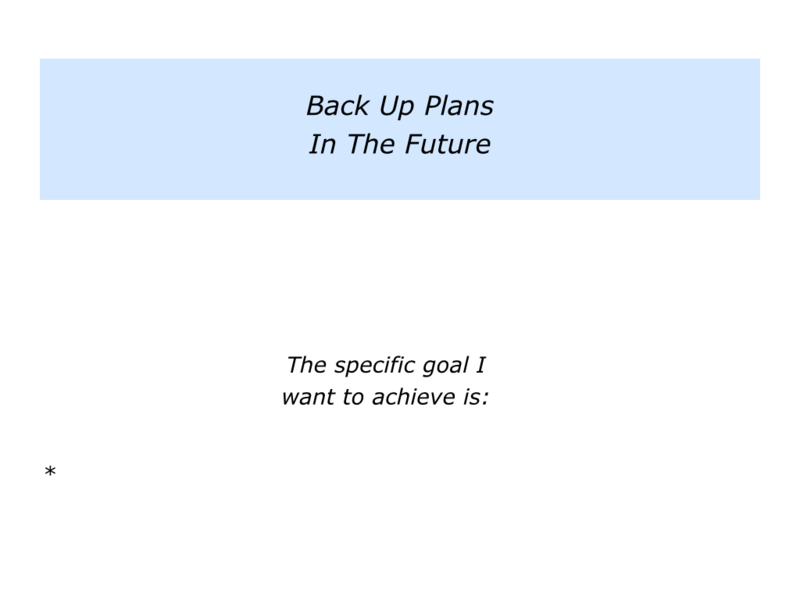 You may pursue Plan A to reach your goals. But it is also important to have a back up plan. 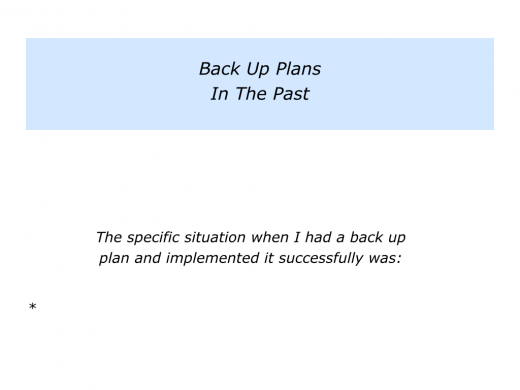 You may actually have a Plan B, C and D.
Looking back on your own life, can you recall a time when you implemented a back up plan successfully? You may have been travelling on a journey, pursuing a strategy, leading a project or whatever. 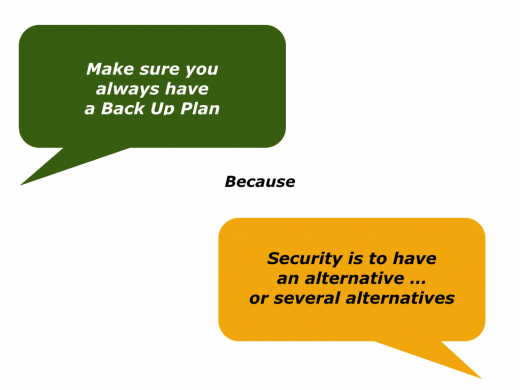 You may have created the back up plan on the spot after unexpected events created confusion. 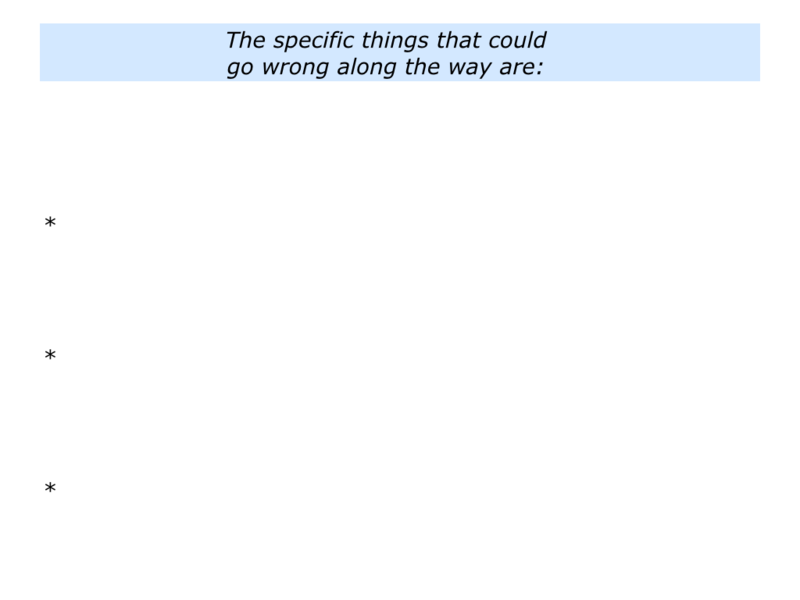 On the other hand, you may have considered your options before setting out. Looking ahead, you may have worked through the following themes. Entrepreneurs are often considered to be risk takers, for example, but this is not necessarily the case. They are like mountain climbers and often make back up plans. Such people start by clarifying their goal and the strategies for reaching the summit. They consider the possible risks and put contingency plans in place. They then set out on their journey. It would be a greater risk for them not to follow their dream. 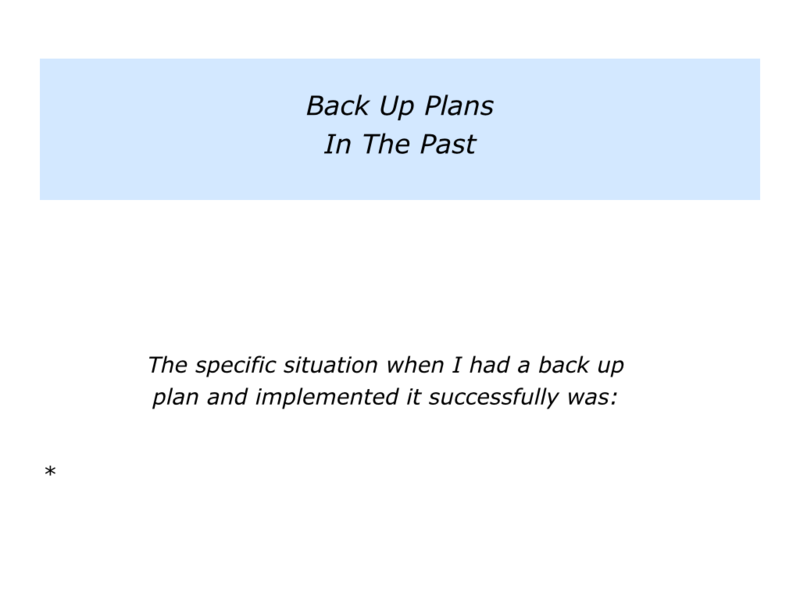 Describe a specific situation where you implemented a back up plan successfully. 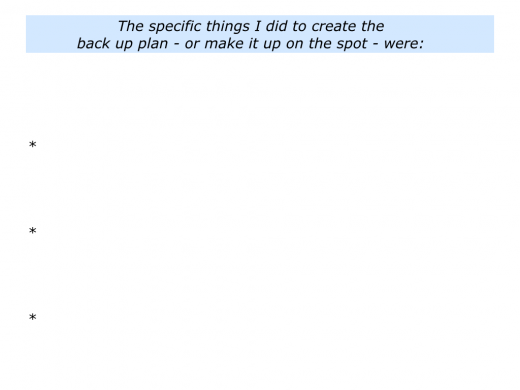 Describe the specific things that you did to create the potential back up plan beforehand or make it up quickly on the spot. Looking ahead, can you think of a situation where you may need a potential back up plan? 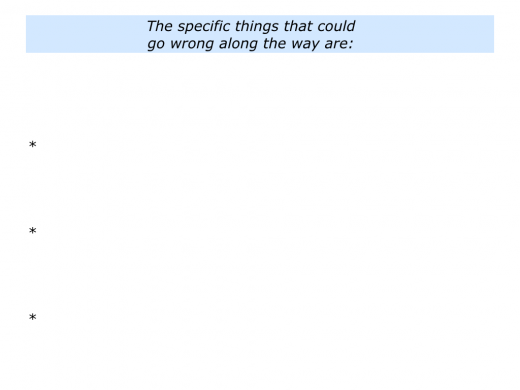 Here are some answers that people gave when considering this question. Performing a challenging surgical operation … Applying to university … Launching a new website … Going for an interview where they might ask curve ball questions … Travelling on a potentially hazardous journey. As the soccer coach, choosing a particular strategy for an important match … Starting my own business with a limited amount of money … Getting older and needing to take care of my health … Having a disciplinary meeting with a staff member. 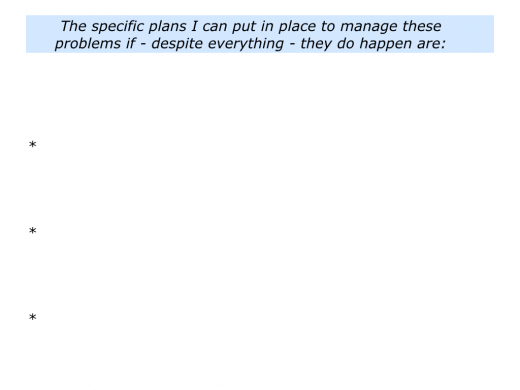 Peak performers tend to be positive realists, however, and make contingency plans. They have a positive attitude, but are also good at reading reality. 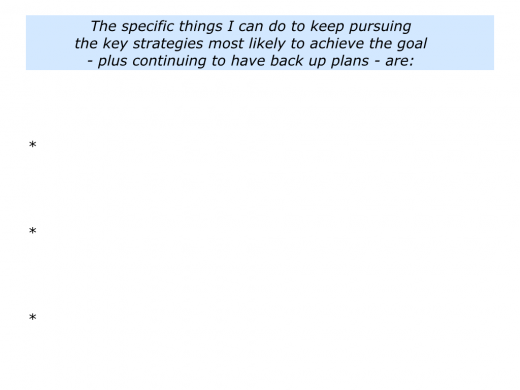 They focus on the specific goal to achieve, but believe in being well prepared. They do this whether they are climbing a mountain, going to the South Pole, competing in a marathon, building a business, singing at a concert, playing a sport, building a house or whatever. If you wish, try tackling the exercise on this theme. 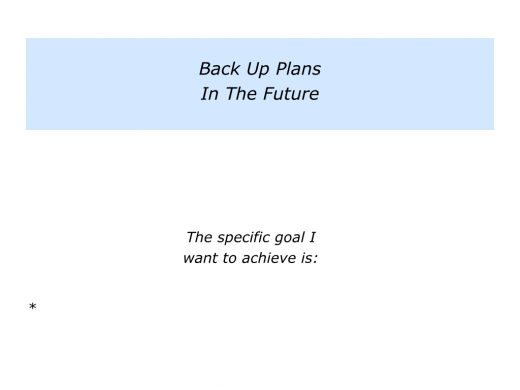 This invites you describe a specific goal you want to achieve and also put in place back up plans. You may then feel more comfortable pursuing the key strategies you can follow to achieve your picture of success.